In 2015 I was invited to a residency at Keur Laminaire in Saint-Louis, Senegal, which is four hours north of Dakar by car on the western edge of the African continent. In early 2016 I arrived in Saint-Louis to produce a new community-engaged work on the 200th anniversary of the grim events related to the stranding of the French frigate Medusa, an event that remains a strong reminder of the perils of poor leadership and a corrupt bureaucracy. In the summer of 1816 the Medusa ran aground on its way to Saint-Louis, Senegal, captained by an inept officer who had been appointed by the King of France. While each of the lifeboats that left the Medusa had its own story of rough seas and treacherous travels along the sun-burnt shores, the story of this makeshift raft, abandoned by the captain and set adrift with more than 150 people aboard, captured the contemporary imagination and is most strongly remembered now through Theodore Gericault’s giant painting Le Radeau de la Méduse (1818 – 1819) which hangs at the Louvre. In my work, I try to approach each project with an open mind and few preconceived ideas of what the finished work will look like. This activates the production process and results in a project that reflects the specific community and context within which it was produced. 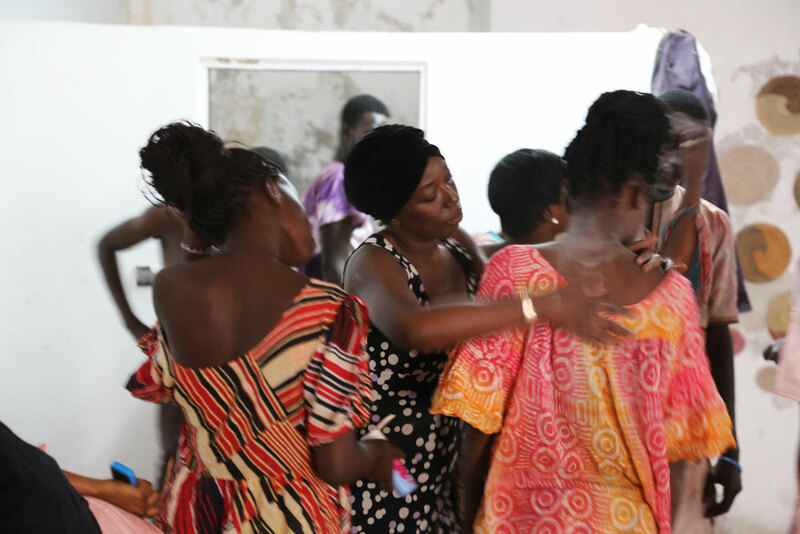 For this project I spent five weeks in Senegal, researching, building, rehearsing, and recording a set of tableaux vivants in video and photographs. In Saint-Louis I set up shop at a makeshift studio in an old warehouse that was once at the heart of the colonial outpost. From there I set out searching for more than a week, meeting people in the community - artists, actors, boat builders, craftspeople, historians, musicians, administrators, etc - trying to figure out what project would make sense in this specific cultural milieu of a post-colonial Senegal. Finally, after meeting formally and informally with many people in the community I settled on creating a raft made from scraps of dismantled pirogues (handmade and brightly painted wooden fishing boats), architectural scraps, and other elements found while roaming around the island of Saint-Louis and the adjacent fishing village of Guet N’Dar on the Langue de Barbarie. 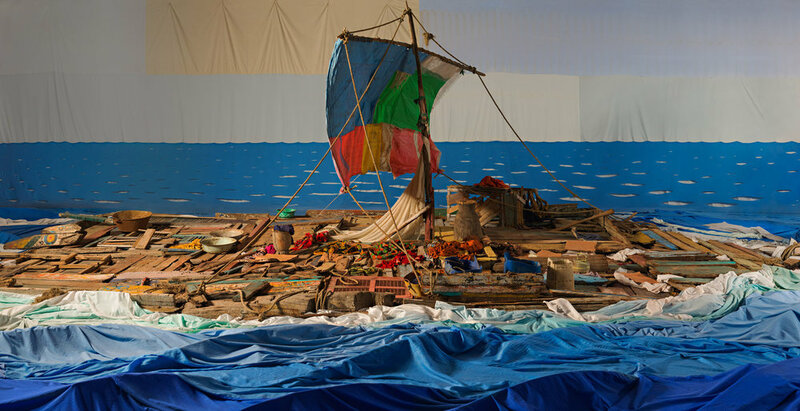 The background and the water for the set were made from 300 meters of cotton fabric. Everything was built locally, including the 4-meter tall “sun” lighting the set. Supported by the Canada Council for the Arts, and produced with the assistance of more than fifty locals, this project represents my largest community-based project to date. 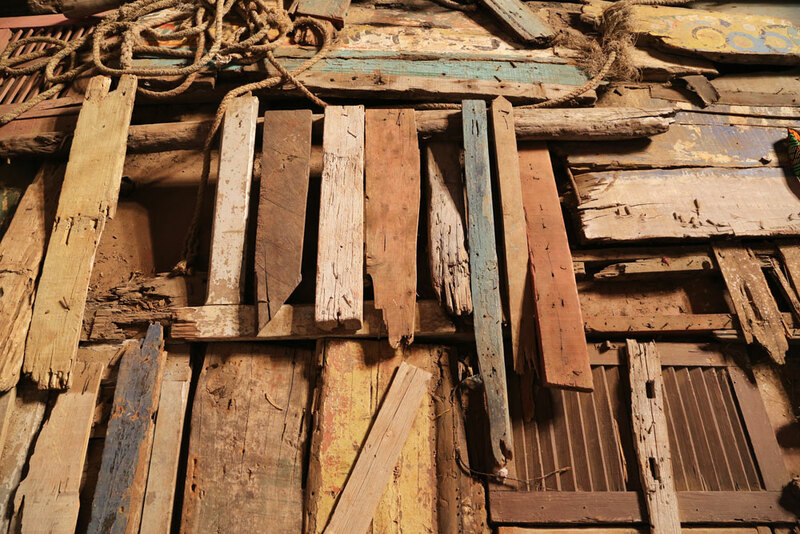 It was performed live four times in May 2016 and was exhibited in the off-site programming of the Dakar Biennale in the same month. In October 2016 it was included in the Lagos Photo Festival in Lagos, Nigeria. This isn’t the first time I have made a community-based artwork inspired by Gericault’s historic masterpiece. In 2009 I went to the remote community of 100 Mile House, BC to produce The Raft of the Medusa (100 Mile House), one of my first large-scale community projects. For that project I focused on recreating Gericault’s painting somewhat faithfully; in this new project in Saint-Louis I was not concerned with aesthetic fidelity and focused instead on the historical record and its relationship to the local community, recreating the raft as drawn from memory by Alexandre Corréard, one of only fifteen survivors who made it to Senegal. I imagined what life might have been like during those seventeen days, drifting listlessly at sea. By re-staging this historical moment I re-contextualized the events on the raft not through a change of location but through a temporal shift of 200 years. This both draws attention to the original tragedy of 1816 as well as exposes obvious parallels with contemporary events. 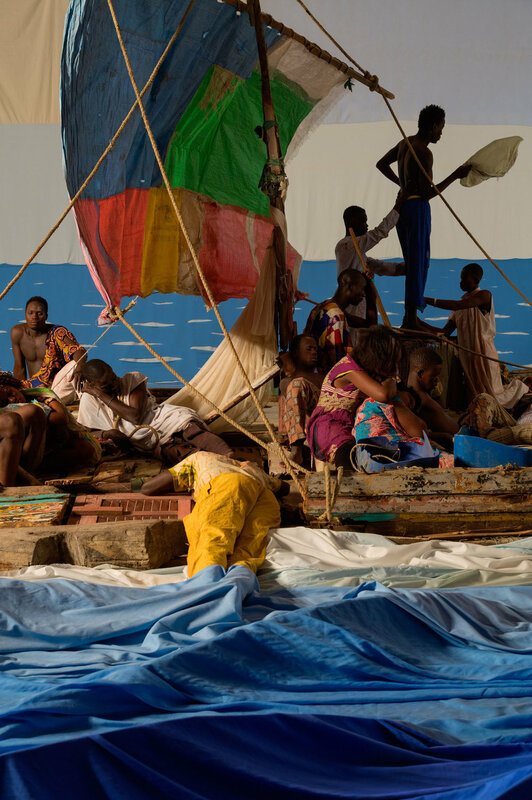 By restaging and reshooting the same events Gericault explored in his painting, a melding of the historical and the contemporary takes place. Papa Samba Sow, Ablaye Cissoko, Zoumba, Cisse Ndeye Fatou, Lamine Ndiaye, Bocoum Abdoulouye, Boubou Seno Dieye, Sene Gabrielle, Seune Ngom, Dieye Oumar, Abdoulaye Diallo, Salif Kiaug, Papa Abdou Gueye, Mouhamet Sow, Babou Mbaye, Sarr Assame, Biram Diouf, Gmagma Wodaye, Alva Ba, Thioune Mombodi, Diatou Boye, Sylla Aissata, Khadim Diop, Fall Bijou, Pape Bouba Diop, Ndiaga Fall, Vieux Amadou Ndiaye, Hamidou Hama Diallo, Birane Wane, Fatou Fall, Henriette Fall, Faty Fall, Kebe Amadou Lamine, Clerc Christophe, Guinez Raoul, Aicha Mbaye, Khalilou Seill, Seymabou Diawiana, Mome Aroume Diollo, Arame Diop, Papa Maguette Kamara, Makhtar Ba, Malik Drame, Yaye Fatou Ndiaye, Dieye Mankeur, Khonte Yerim, Diegnaba Yacine Gueye, Makha Mbaye, Marie-Caroline, Aissa Dione, Thierry Desolas.